Small device clips onto your phone (not included) and uses the flashlight to project vibrant storybook images onto any surface! Moonlite is a cute, easy-to-use device that turns your smartphone (most Android and iOS devices) into a storybook projector! Moonlite clips onto your smartphone (not included) and uses the phone’s flashlight to project vibrant storybook illustrations onto any surface. The free Moonlite companion app contains all of the words to the stories to help you read along while projecting the storybook images. 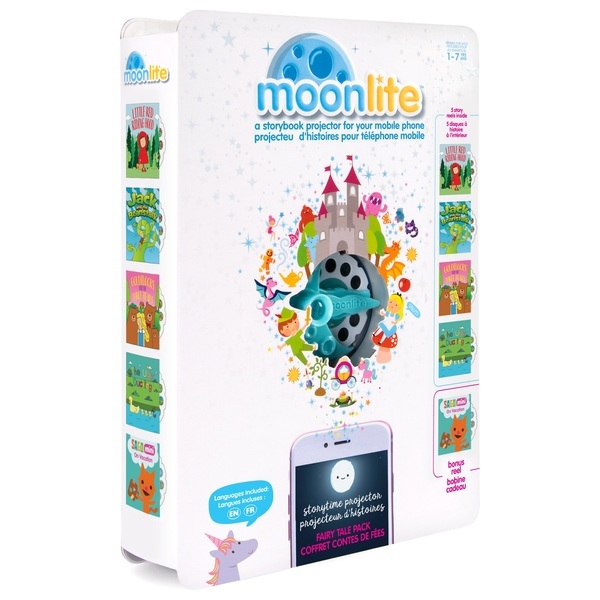 The Moonlite app also includes charming sound effects to make story time even more magical. Packaged just like a storybook, Moonlite slides right onto your bookshelf and comes with two delightful stories. Ignite the love of reading and develop your little kid’s big imagination with Moonlite!